Dubai Opera will premiere the much-acclaimed “Mughal-e-Azam: The Musical”, directed by Feroz Abbas Khan and produced by Shapoorji Pallonji, in January 2019. The musical will be showcased at the Dubai Opera with five shows from January 10 to 12, 2019. K Asif’s classic Mughal-e-Azam has been adapted as a Broadway-style musical and is touted as the biggest theatrical production from India. Mughal-e-Azam-The musical involves live singing with dance sequences. The essence of the evergreen movie has been captured in the musical through larger than life set designs, intricate costumes and elaborate choreography. The renowned Indian playwright Feroz Abbas Khan, known for plays like Mahatma vs Gandhi, Tumhari Amrita, Saalgirah and Dinner with Friends amongst others, brings classic movie Mughal-e-Azam to stage as a Broadway-style musical. He has also directed Gandhi – My Father and won several honours for the movie. The epic love story has been beautifully told on celluloid and is the hallmark of Indian cinema today. The stage production has all the dramatic elements one wants from a musical — thunderous dialogues, melodious songs and mesmerising dance sequences. This is a world class theatrical production from India and has been proclaimed as the first Broadway-style musical. The play has swept the Broadway World Awards, bagging awards in seven categories including Best Play and Best Director. It is a homage to K Asif’s classic movie, Mughal-e-Azam, whose dialogues, music and songs are part of the cultural memories of many generations and the director has weaved together a rich, colourful tapestry of ideas that touches upon class-wars and love in the face of rebellion. The production design has been undertaken by an expert team from Broadway. Manish Malhotra has lent his costume design expertise by designing 550 costumes that reflect the regality and opulence of the Mughal era. Dance sequences have been choreographed by Mayuri Upadhya. Mughal-e-Azam - The Musical brings the dramatic extravaganza to life and creates a connection with the audience of today. It brings the richness of the Mughal era to movie and theater lovers. The love story has all the elements of a nail-biting drama. Emperor Akbar’s wife Jodha gives birth to Salim, who grows up to be a spoilt and disrespectful teen. Consequently, his father sends him to the battlefield and war to teach him courage and discipline. Fourteen years later, he returns home as a distinguished soldier. Salim, now a young man, falls in love with Anarkali, a lowly courtesan. And so, the story goes. 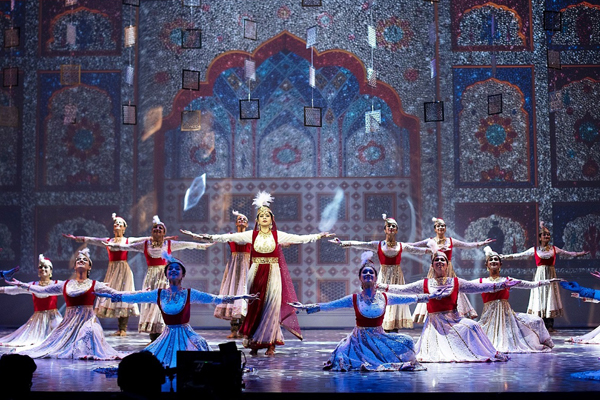 Mughal-e-Azam is an event that will be promoted by Dubai Shopping Festival and is part of the Dubai Calendar.